Whitening procedures are not a solution for all discoloration (e.g. darkening caused by cavities). Similarly, whitening does not work on all stains. Dr. Hanchett is committed to helping you choose the best option for your personal situation. Some cases that are not appropriate for whitening procedures can be effectively treated with restorative options. Take home whitening procedures can whiten your teeth about 4 to 6 shades on a standard scale showing the range of teeth color. Our in-office whitening can whiten the teeth up to 8 shades, depending on the level of initial discoloration and your desired results. Opalescence Boost Whitening is an in-office treatment that provides you with superior results in about an hour. It uses a chemically activated formula that allows Dr. Hanchett to whiten your teeth without any bothersome heat or ultra-violate rays. Additionally, the chemical formula contains potassium nitrate and fluoride that help to improve your oral health by strengthening the enamel, decreasing sensitivity and increasing resistance to cavities. You may also choose to chemically whiten your teeth at home. 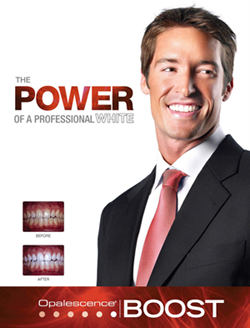 In this case, Dr. Hanchett will fit a tray to your bite, and provide you with a mild whitening gel. Over a course of weeks or months, you regularly apply the gel to your teeth using the tray. This method is more gradual, and less noticeable to others. In rare instances, some patients experience gum sensitivity or discomfort in response to the gel.